There are probably one hundred food choices within a couple mile radius of me at this moment, and thankfully, I don’t have to make a decision where to eat. My eyes were bigger than my stomach last night and I bought a burrito with two tacos and the burrito alone filled me up. Easy decision tonight: leftovers. I’m traveling for work this week and find myself in Houston Texas. Back home in New York, we don’t have many restaurant choices in the small town I live in. If we want something different, we usually travel to a small city about thirty miles away from us. As a family, this can still be a dilemma because not everyone agrees on where to eat. Majority rules, a decision is made, and somebody settles for something on the menu that obviously wasn’t their first choice. When we travel, be it a day trip or longer, we will always choose a restaurant that we don’t have access to in our immediate area. It’s an unwritten rule and everyone buys into it. Where we differ is the degree of adventure we are willing to subject our taste buds to. My oldest son and I will try most anything. My wife and youngest son however are a little less willing to try new things. So why is it when I travel on my own and have nobody to please but myself do I find it difficult to make a decision on what or where to eat most of the time? I asked myself this question tonight and had to think about it, realizing that most of my indecision is coming from places I might travel to where there is a “choice” overload. I would equate this to having three hundred plus channels and not being able to figure out what to watch on television. Often, I will be at a hotel that has a restaurant inside or attached to it or has a few eating establishments close by making the selection process much easier. Other times, I am at the mercy of a local who has picked a restaurant for us to eat at. Here in Houston however, the area I stay at is called the Energy Corridor and there are restaurants everywhere. Driving is problematic during rush hour and a short trip to a restaurant can take forty five minutes. It’s not the type of place to keep driving around looking for a place to eat. Our company has a very generous policy when it comes to dining out while traveling on company business. I don’t abuse it and usually only have one or two meals at restaurants. The other meals will be takeout and typically low cost. 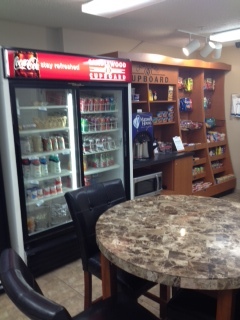 I travel to Houston about three or four times a year and the hotel I stay at is an extended stay hotel with a kitchen so I will also buy groceries for breakfast and sometimes grab a meal from the “pantry” as they call it and have a microwavable meal. My feeling about spending company money on food is to spend it as though it was my own. I would not eat $40 or $50 meals on my own so I don’t expect to do that on the company’s dime. Yeah, moral me. As I stated earlier, I don’t want to eat a restaurant that I can eat at back home. So my first night here is always a no-brainer. 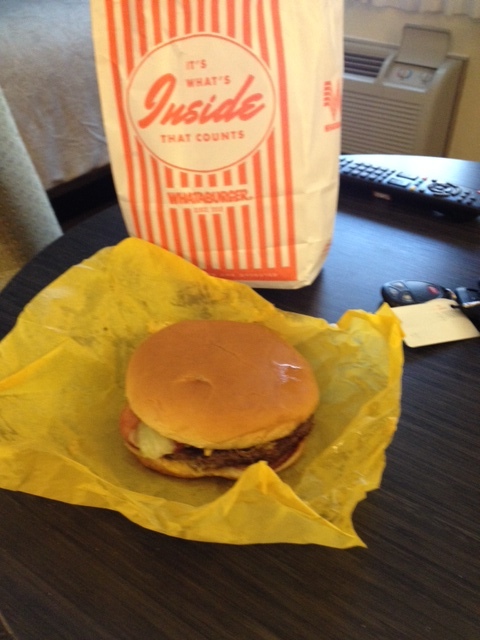 I checked into the hotel, unpacked, and headed out to the nearest Whataburger. If you know me, this is a given. One burger, less than $5, and 790 calories of my daily diet is gone. If you have been lucky enough to have enjoyed a Whataburger, you understand. Night two involved my driving around which was a big mistake. 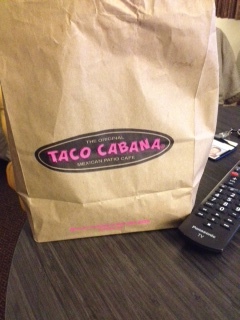 I wanted Mexican Food, saw a place called Taco Cabana and ordered what turned out to be enough food for two nights. Meal cost? $11. Tomorrow will be my last night here and I will eat at a restaurant. My plan is to stop there on the way back to the hotel after I get off work. I saw a Japanese restaurant today that a few of the employees at our sister company recommended to me. If I pass that, I have about twenty more choices along the frontage road before I hit the street I need to turn on to get to my hotel. If I remain indecisive during that drive, I’ll get to the hotel and walk to a restaurant. There just happens to be about five or ten within walking distance. 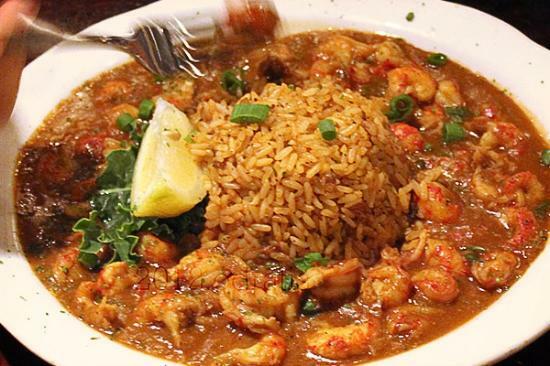 Taste of Texas, Pappadeaux Seafood, Pappasito’s, Fuddruckers, some deli, and so on, and so on. More decisions… although I am only willing to walk so far. Choice overload. I know one thing. I will eat. How about you? Is your choice of dining establishment an easy decision? Elmira Store is a mile up the road and serves the best huckleberry pancakes. The gas station 2 miles the opposite direction has the best jalapeno burger around and on Saturday nights they slow cook prime rib. That’s it! Two choices! But we can drive to Sandpoint 15 miles south or CDA 45 miles away for more more choices. I miss the ethnic food of Minneapolis and love to try regional foods when I travel. Have a safe journey home! We have about eleven or so choices in town which really isn’t bad considering three of those are chains. We also have three Chinese restaurants which is very odd for a town of 5500 people. As for your country living, two would be tough. I’m with you on the ethnic foods. When we lived in Arizona, our choices were endless. I love jalapeno burgers! I should restate that, I love jalapeno anything. Very handy. I wish I had a pub at the end of my road. You know that picture up there with all the orange … I find it highly offensive!!! 🙂 I think I’ll have to start reporting them every time you post one so that I don’t go into Whataburger withdrawls! Joking aside. So true about Whataburger, those that haven’t tried it are missing out. I’m a fan of Jack In The Box too and we don’t have those in Kentucky. My town is much like yours. We have a few fast food joints, one country cooking spot and then a decent Mexican Restaurant. Any larger chain restaurants are 45 minutes away. And our family policy is much like yours, when we are out of town, we try to eat some place that’s not available to us at home. You’ve never had Taco Cabana? They are all over Texas. I’ve eaten Fuddruckers, but it’s never been one that I just loved and although I’ve seen Pappadeaux Seafood and Pappasito’s, I’ve never eaten at either. Another good one that I like is Scholotzsky’s, which was started in Austin. Oddly, we do have one about an hour away from where I live, but the kids and hubby aren’t really a fan. If you ever come up on one, you should try it out. Give my home state a big wave for me as you leave and I hope this time your travels go much smoother! In AZ, we had something similar to Taco Cabana called Dos Pesos. My brother told me they copied Taco Cabana and got sued for it. No Jack in the Box in NY either and I honestly thought about getting a sourdough burger here the other day but the guys I worked with ordered me Popeye’s Spicy Chicken . We use to have Scholotskys in AZ! I remember they had a choice of jalapeno bread for their sandwiches. I was so tempted to go to Pappadeaux tonight for crawfish but decided on this place called Zoes Kitchen. No regrets. I had a Gruben – grilled turkey, Swiss, slaw, spicy mustard, on rye. Yum! We live in a tourist area so we have an overabundance of dining choices. It’s a running joke that I always tell my husband to pick the place, but I often exercise my veto option (otherwise known as a woman’s prerogative). I am a creature of habit, though, and I tend to stick to places we have visited and enjoyed. At home I tend to stick with places we enjoy. When we visit nearby towns or cities we like to try something new if we can (my wife of course also having veto power). I think that is why decisions are so tough when I travel for work: I rarely get to decide on my own. Thank you for reading and commenting! The choice is NEVER easy! Sometimes I’ll just give up, call it day and find something at home! Thank you for sharing this article! You’re welcome and thanks for reading. I get to try Dallas-FW area food next. As long as there is a Whataburger and good Mexican food, I’m good. I’m originally from Arizona so I’m used to a little different style (more Sonoran style) than Tex Mex. It’s all good though.